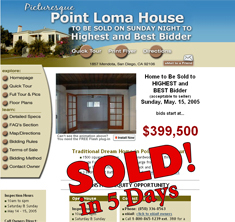 Coast to Coast in America and Canada, major and remote cities alike, 5 Day Sale sellers have discovered the power of the Internet to sell your home fast. 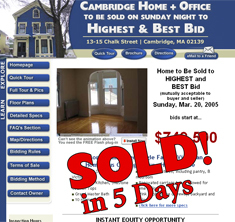 Choose from below to learn how to sell your home fast with an effective, informative website that drives prospective buyers right to your open house. 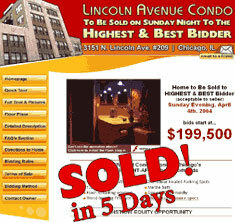 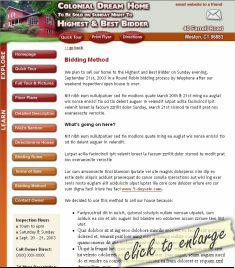 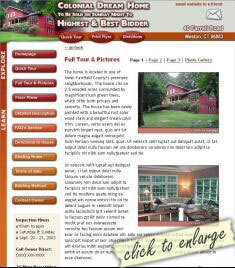 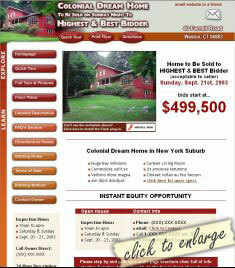 A glimpse of just a few of the thousands of 5 Day Sale "Sell House Fast" Best-Bidder Sales. 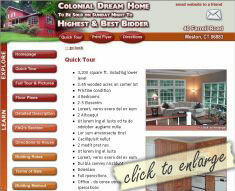 Preview the Website Design you'll receive. 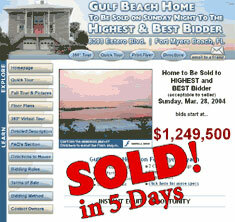 View a complete "5 Day Sale" website. 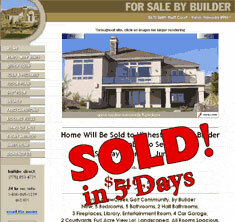 These website samples have been created specifically for the 5 Day Sale Method, by professional website designers. 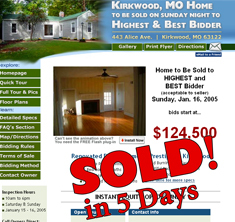 They are a tried-and-true method to reaching 77% of prospective buyers, and conveniently answer their questions 24-hours a day leading up to the day of your sale. 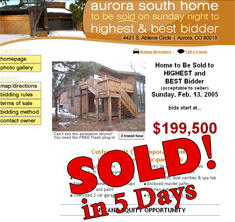 Learn more about using the Internet to help sell your home fast with the 5 Day Sale Method. 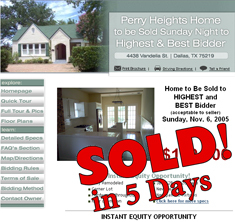 Below are samples from previous successful "sell house fast" 5 Day Sale campaigns from across the country. 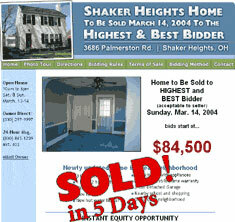 Click on any of the images to learn how YOU can sell your home fast with our powerful Internet marketing strategy. 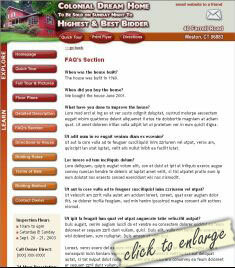 You can preview the specifics of our unique websites designed to sell your home fast to the right and below. 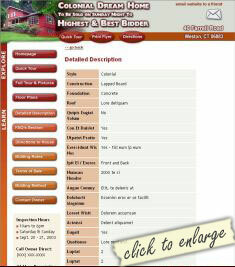 Though the overall design is tailored specifically to your house and your sale, the pages are laid out similarly based on what buyers need to know about your home. 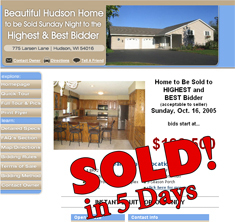 You can learn more about the powerful Internet marketing techniques used to sell a house fast with the 5 Sale Day Method. 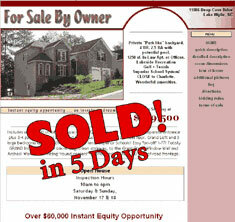 George Cappony includes this effective method in his coaching packages. 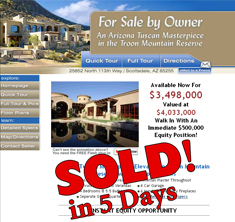 Contact George Cappony for a FREE 30 minute consultation to find out more on the specifics of how to sell your home	fast. 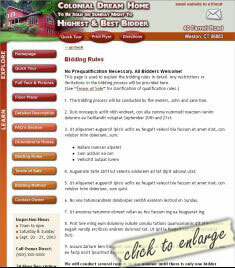 Copyright © . 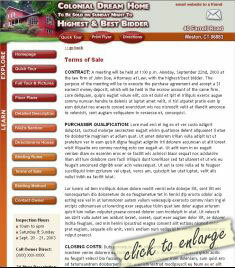 Sales Systems Inc. All Rights Reserved. 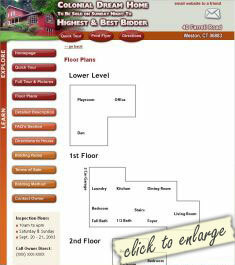 Site maintenance by Light Creations Web Designs.